Paul Hollywood’s Bloomer | what? bread? Nicey IC. Yeah going by weight for salt and yeast is a bit worrying. I go by teaspoons myself. One of each every time! I tried to cook the Paul Hollywood Bloomer – I am a bit of a bread virgin but keep trying. My first rising rose well, but my second rising spread outwards not upwards, which leaft me with a very nice, but flat and quite dense loaf. Any Tips? You might have had a bit too much water, but with a soft dough you can also try folding in thirds a couple of times before you shape it finally. Pat it out to knock out the air, then fold in on itself from top to leave the bottom third uncovered, then fold up the bottom third to form a pile 3 layers thick, turn through 90 degrees and fold in 3 again, then turn again, pat it out a bit and fold in half with the seam underneath. Don’t pat it out into a long and narrow shape, leave it kind of brick shaped and it should hold together. You might also be leaving the 2nd rise too long. Keep trying though! Thanks – i’ll give that a try. I’ve had this a couple of times. At one stage I was using too little water and getting really hard bread. Since then I’ve been adding more water. Maybe gone a bit too far. Experimentation needed I think. Good luck and keep trying. It’s not an exact science. It also depends on how warm your kitchen is and how accurate your oven temp is. You could also try raising the temp in the oven a bit and turning it down a bit sooner. I mostly bake at 240C and turn down from there. 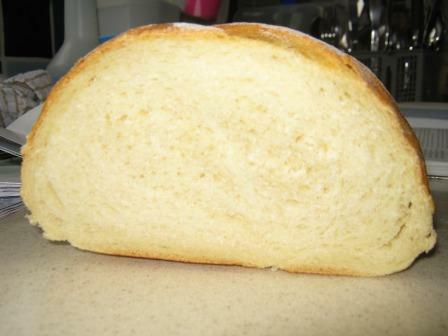 I’ve now tried the Hollywood Bloomer twice (having had no real experience of making bread) – on both occasions the bread looked like it was under-cooked when you cut into the middle of it. It was good for toast, but definitely tasted a little doughy. We have a fan assisted oven. Should I be dropping the temperature and cooking for longer? It is a fine line however sometimes to spot if it is just right or gone too far, if it doesn’t spring back when you’ve poked it you’re almost too late. If anything bake hotter as well. Fan ovens tend to have a maximum temp like 200C, so always start go as hot as it will go with a fan oven. The recipe says start at 220 and drop down to 200, but if you’re using the fan then start at the hottest, reduce by 20 deg, and keep an eye on it for burning. Good luck, keep trying. Hi, I am a complete novice, and have had the same problem with two attempts at Paul’s bloomer and am grateful to all the answers given. My loaf seems to spread outwards rather than upwards on the second prooving, could this be the way I am shaping it? I feel like I need to put some barriers in place at the side so it only rises upwards! I have followed step-by-step on the iplayer but maybe I need to fold into thirds a few more times. I shall try again! 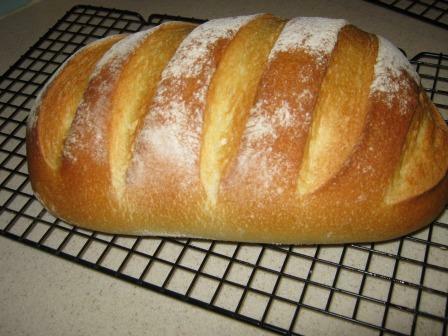 Wonderful blog by the way, I will be visiting regularly now that I have got the home bread-making bug! Thank you 🙂 for your kind comments. Good luck with trying again. Even if it doesn’t match what appears on TV it’ll probably be edible. hi, i have paul hollywoods book, but not sure if i can use the recipe for a sourdough and substitute wholemeal flour instead of plain flour to make wholemeal sourdough?? Had a go with several bloomers .taste great but dont or cant keep shape , like quatermass experiment they just seem to spread out over the whole baking sheet.any ideas? 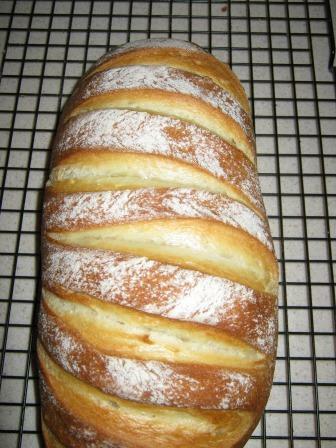 My bloomer always spreads and ends up flat, the first one I made was good but have not made a good one since. Feel like giving up ! Sorry to hear that – take a look at the tips on this page http://wp.me/p2j8wW-e4 which might help. Do you bake other breads? I find Dan Lepard a lot easier to manage and always successful. Still relatively new at bread but tried Paul’s bloomer… Looks great but Sooo salty! I put in salt as per recipe and too a bit out as it seemed too much… Will stick to a small tsp next time! Bread can taste yeasty for lots of reasons, such as: if it is proved at too high a temperature; if there’s too much sugar; or it has risen too long; or not baked at a high enough temperature. Try not to rush your bread baking. Even if you follow weighing instructions accurately the type of flour you use can influence how much water or other liquid you need. Keep trying is my advice.